Hi everyone! Today I'm posting the last of the three CAS Christmas cards that I made for my CAS Christmas card swap. I started making my card by first running my card front through my cuttlebug machine. Next, I wanted to focus on the main part of my card (the ornaments) and I ended up embossing glitter over them. I colored over the ornaments using my VersaMarker and then I sprinkled SU's Iridescent Ice embossing powder over it. Then all I needed to do was to heat emboss my glitter. It's hard to see the glitter on my card, but if you click on my photo the picture will enlarge and you might be able to see it a little better. My last step was to add my ribbon and stamp my Merry Christmas sentiment. Although my card does include heat embossing, it's still clean and simple. I had six of these cards made in about 1/2 hour! One more thing before I go, I started a new CAS card swap and I would love to have you join me. You can find my card swap thread here. Thanks for taking the time to stop on by! I'm back to my regular postings so be sure to come back tomorrow. Make it a great day! CAS and oh so elegant. Love the added effect of the red ribbon! Not only CAS, but elegant as well! So pretty! 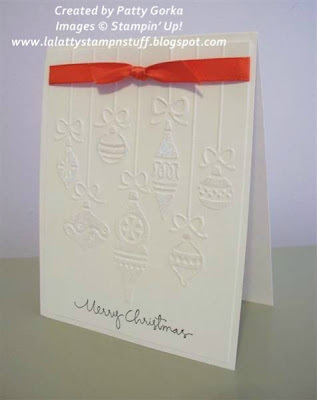 Love that embossing folder. OMG~this is gorgeous! I love the simple elegance of this card! What a beautiful holiday card! Wonderful CAS card Patty. Love the glitter ornaments. Lovely card! Iridescent Ice is always a good choice! I'm an oh, so lucky recipient of this awesome card! Eat your hearts out, ladies. And thank you, Patty.